I don’t mind saying, this burns me. I saw an ad last night for Dove Beauty Bar claiming that soap leaves soap scum behind, but their “beauty bar” rinses clean. That’s not soap scum that real soap leaves behind. One of the by-products of the soapmaking process is glycerin, which is a humectant. Humectants, like glycerin (honey is also one), draw moisture from the air to your skin, moisturizing it with water, nature’s most perfect moisturizer. You want soap to leave glycerin on your skin. This is a good thing. Dove Beauty Bars aren’t soap. Yes, they may look like soap, but chemically, they’re not saponified oils; they’re detergent bars. If they were real soap, there’d be no need for them to add “1/4 moisture cream” or to push their lotions. When you use real soap like the ones I sell, two important things happen to your skin. One, the soap molecules bind with dirt and germs on your skin. Soap doesn’t actually stick to skin, so in binding with the dirt, it lifts the dirt to be washed away when you rinse the soap off. Two, the soap leaves behind a thin, invisible layer of glycerin. The glycerin draws moisture from the air and brings it to your skin, so you get clean and moisturized in one step. Now, there is a caveat to this. If you live in a very dry environment, the glycerin will draw moisture out of your skin, leaving it dry. You’d need to follow with a moisturizing lotion. One trick I use to get the maximum benefit from the glycerin as we head to dry winter months here in North Carolina is… Well, I make my morning routine work for me. After my shower, I take my vitamins and floss and brush my teeth. While I’m doing that, I leave the bathroom door closed, trapping the steam from my shower in the bathroom with me. While I’m tending to my teeth, the glycerin from my soap is drawing that moisture in the bathroom to my skin, making it silky and soft. I seldom have to use lotion and if I do choose to use it, it’s for the scent. You’re reading my blog, then you decide to see for yourself what the excitement’s all about, so you find a convenient link and head on over to my website. You poke around, check out my wares, but then you leave. What’s up with that? What would it take to entice you to try for yourself the superior soaps, bath and body products offered by Sara’s Soaps ‘n Such? Maybe if I told you something about the products? The colorful handcrafted soaps that grace “The Soap Table” are made of high quality glycerin soap base and a luscious assortment of scents. Sure, a lot of people buy these soaps to admire in a bathroom or to give as gifts for other people to admire in someone else’s bathroom, but there are also “functional” soaps to complement the “fancy” ones. (All my soaps are very safe for use, by the way.) The handmade soaps that share space on “The Soap Table” are made of the finest ingredients in small batches – usually 3-4 pounds – to ensure the highest quality product. I formulate each soap batch to create a luxurious, bubbly soap that’s nourishing for your skin and a treat for your nose. My personal favorites are Ooh La La-vender and The Soap of Milk & Honey (and Oatmeal). Now, what about those scruptious body treats standing at attention on The Such Table? Goat’s milk lotion deep conditions skin while delectable scents provide a light perfume. My Revitalizing Body Polish is a spa treat for the shower, exfoliating and moisturizing in one easy step. Then there are my all natural products… Tea Tree Balm to soothe away rashes and bug bite itches. Bath Teas to relax and rejuvenate both body and mind. Lip Balms that nourish and moisturize lips in yummy natural flavors. And my best seller, Go Away Bugs!, my 100% natural mosquito repellant that’s DEET free, making it safe for all ages and sensitivities. Often in the midst of enjoying the relatively new-found – OK, so it’s now been 6 months already! – pleasure of making soap completely from scratch, it’s easy to forget the simple pleasure of a well-poured tray of handcasted soaps. 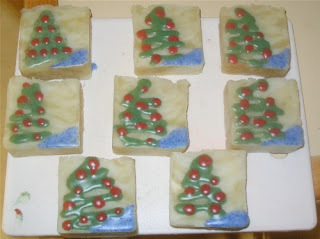 This week I’ve been trying to get my Christmas shaped soaps restocked. One such soap is my Gingerbread guest soap, which I color with a pretty brown spice. There’s a simple pleasure in seeing the soap from the bottom of the mould and noting that it’s so well mixed that the colorant didn’t settle to the bottom, giving me pretty, uniform speckles. Today was one of those chilly, blustery Fall days that make you pull out the winter coat and dream of hot drinks in the evening. I poured my soaps, did some dishes and paid some bills. In fact, it was such a quiet day that I had time to enjoy a good book and take a power nap before running my afternoon errands. When I woke up from my nap, I looked out the back door and saw this plethora of bright colors. It’s like all the leaves had changed when I wasn’t looking, transforming our back wooded area into a kaleidoscope of brilliant yellows, reds, oranges and greens. Seeing all those lovely Fall leaves was a nice, simple pleasure. Finally my daughter and I came home, and the starter for Amish Friendship Bread that my friend Cookie gave me was ready to become bread. Amish Friendship Bread takes 10 days and about half an hour of prep time to make, then another hour to bake. It’s active. You get to mush it up in a bag every day, and seven days into the process, you add sugar, flour and milk to it. Then you mush it some more. The fun part to watch is, after adding the sugar, it reacts with the yeast and releases carbon dioxide, which causes bubbles and makes the bag puff up. Sunday morning, we discovered that the expanding bag will also push stuff off the counter if it’s in its way. Anyway, my daughter and I donned aprons and got to work on our bread. We also sectioned out some starter to share with our friends, and I’m trying to decide if I want to keep the fourth bag of starter (you’re supposed to, according to the directions), or give it away, too. I think it can be frozen, which will be a good idea, as I can save it for closer to the holidays. The mixture makes 2 full-size loaves, and our first one is in the oven as I type this and smelling awesome! Besides the very long prep time for this bread in our “gotta have it now” society, the instructions say that you can’t use metal in the mixing at all. This means using a plastic bowl (melamine in our case, but I use them for mixing all the time, anyway) and mixing it with a spoon by hand. I don’t even mix my soap by hand! Sometimes the simplest ways bring the most pleasure. I took yesterday off from soapmaking to enjoy the NC State Fair with my family. We had a blast!!! My daughter is at that age now where she’s really into the rides, which made it hard for my husband and me to enjoy the buildings and displays. We didn’t even make it into some of our “must do” buildings (we always enjoy the really creative garden displays). Hubby and I alternated riding the rides with her, and we let her ride one ride by herself, which thrilled her to no end! As my daughter and I rode this one ride called the Traffic Jam (yep, it was a kiddie ride), I thought to myself, Wow, for three tickets, this is a pretty good ride. I’ve discovered that she likes speed; the faster the ride goes, the happier she is. I also thought it was pretty cool that she was putting her arms up in the air and stuff like that. When I was her age, I was still clinging to the bar. In addition to the tons of samples, it felt like we ate all day long. We ate breakfast there at the Apex Lion’s Club concession stand (we always pick this place because we know the food’s gonna be good). Mmmmmmm… For me, a sausage biscuit where the biscuit was a scratch-made buttermilk biscuit and a bowl of these absolutely divine grits. (For those of you who may be unfamiliar with grits… It’s a hot cereal made with coarse-ground corn. I like mine with butter, sugar and just a titch of salt and pepper.) All I wanted for lunch was a hot dog, and then before we left, we got funnel cake and Hubby just had to try this year’s deep-fried goodie, deep fried pecan pie. I tasted it, and really, it wasn’t that bad, but I think I’ll stick with my funnel cake, thank you very much. Standing tall right beside Dorton Arena on the fairgrounds is the Ruth Graham Memorial Waterfall. Mrs. Graham is the late wife of Jim Graham, who was the NC Commissioner of Agriculture for many, many years. She died of Alzheimer’s Disease, and the money collected in the fountain goes towards Alzheimer’s research. We always sit by this fountain to enjoy our funnel cake and to catch our breath before battling the crowds heading out of (and some coming into) the Fair. After the last bite of funnel cake is gone and I’ve brushed as much of the powdered sugar off as I can get, I toss my change into the fountain, wishing, as always, for a cure for this disease. Up until 2005, I wished for a cure – one to come quickly – so my Grandma would be made well. After her death in Spring 2005, I wished for a cure so others wouldn’t have to know the pain of watching a loved one slowly die little by little from this dreadful disease. After a few weeks of experimenting with new techniques, creating new scents and even re-experiencing the simple pleasure of a measuring cup filled with beautifully colored melted soap base this afternoon, I decided I needed to rebatch some soaps that, for all intents and purposes, looked and felt like they’d glycerin sweated inside their wrapping. I shredded the bars and drizzled a little milk over them, same as I always do. I let it meditate for a few hours, covered, before placing the bowl in a warm oven for 2 hours. While that was going on, we put our daughter to bed, and I was nestled in on the sofa watching some shows I’d taped this past week. Then I heard it. The subtle click of the oven as it controlled its own temperature. I looked at the clock on my laptop and realized, Oh, crap! I’d forgotten about my soap!!! On the plus side, I’d only gone over by about ten minutes. On the negative side, though, I was rebatching a much smaller amount than my usual three-pound batches. I opened the oven door and carefully pulled back the aluminum foil to discover my soap had volcanoed (though, thankfully, stayed in the bowl, so no oven mess) and it was the lovely brown of rich, luscious, high-grade honey. This soap started out cream-colored. It maintained its fragrance and doesn’t smell burnt, so I’m hoping it’s OK. I added a bit more tea tree oil to make up for any that may have gotten burned off in the oven and glumped it into my mould. It’s going to be OK, but I’ve never had a rebatch do this to me before! *Sigh* One of my soap buds and I keep our chat window open all day, and I knew she’d had some bad soaping luck today, too. I told her there really should be a sign when it’s not a good day for soaping – one that comes before we start the process. Wow! It’s hard to believe that Halloween is just a week away! It seems like just last week it was warm and toasty enough here in central North Carolina to get by wearing shorts and t-shirts. Oh, wait. It was last week when it was that warm. Now Autumn is well and truly upon us with beautifully changing leaves, cool days and brisk breezes that cause the leaves to crackle against each other. When Halloween’s past, then I get to roll out all the delightful and fun Christmas soaps I’ve been working on and likely will continue working on until the very last minute. These here are one such delight. I created a custom fragrance that I call Christmas By The Sea, a scent reminescent of our annual trips to the coast for the Crystal Coast Christmas Flotilla. I borrowed the name from this shop that used to be on the island where we always vacation. Christmas By The Sea (the shop) was a charming Christmas store with everything you could want for Christmas – villages, trees, wreathes, ornaments, garlands and gifts. Twelve years ago, my then-boyfriend took me down there (thinking he’d surprise me and not realizing I knew this shop well) to find an angel for the Christmas tree I had in my apartment. When we arrived, we discovered that the Flotilla was going on that evening, so we stuck around for it before driving back home. Since then, the shop (unfortunately) has closed, but the Flotilla continues. That first Flotilla became the start of an Advent tradition for us. The then-boyfriend is now my husband of almost 9 1/2 years, and the joy of watching the Flotilla continues and is something we share as a family. Oh, and in case you’re wondering, the angel I bought then still graces our tree, year after year. That’s a lot to go into an unassuming bar of soap, isn’t it? Happiness, memories, the tang of fresh cut greenery as it meets the scent of home and sea. It’s all here in Christmas By The Sea. Look for it in a few weeks, but it will be ready in plenty of time for the holidays, and even in time for pre-Christmas giving. Here in the midst of silly season as I’m trying to get everything together, I’m now insanely thinking, “Ya know, a home party might be fun.” Um, do what??? Home parties are a lot of work, and the last open house I hosted didn’t have many attendees. So what makes me think I want to do it again? I can’t really say. For one, I think it’d be a lot of fun. We can laugh, be silly and take a bit of time to pamper ourselves. Two, it’d be a good boost to late-year sales, which I’m anticipating being pretty good, though I wouldn’t be surprised if they were down from last year. Three… Well, I keep coming back to that “fun” thing. What do y’all think? There are some considerations. I took time off from my part-time retail job just to get all this fall stuff done. It freed us up when Hubby had to work Saturdays so I could be home with our daughter. It enabled me to enjoy her break from school with her, without having to think, “We’re not going to get any family time this weekend.” And I’ve certainly been busy enough. Then there was that vicious autumn cold that attacked me and still is reluctant to leave me alone. Those are the positives. The negative is, obviously, the loss of that extra income and while it’s not a whole lot, it certainly does help. I could still do the open house if I were back at work, but it’d be a bit more difficult. In the meantime, I’m preparing for November’s First Sunday, my big show which falls on 1 December this year, and, on top of both of those exciting events, I’m going to be submitting samples to Little Black Boxes for this month’s sample boxes and also to Out of the Box for November’s sample packs. I’m busily wrapping soap samples for LBB and today I ordered the bottles and lids for OOTB’s samples. Both companies seem to be very well operated and the contact I’ve had with the owners has been nothing but positive. Posted on October 14, 2008 Categories Vintage Sara's Soaps 'n SuchLeave a comment on What to do? What to do?